Iranian President promises that Tehran will soon unveil “big new” achievements in its controversial nuclear program. 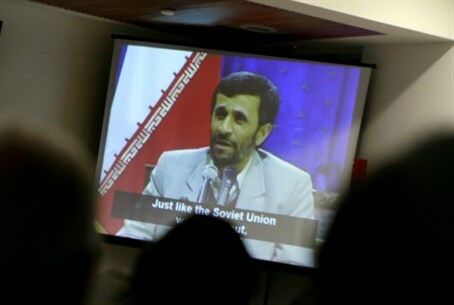 Iranian President Mahmoud Ahmadinejad said on Saturday that Tehran will soon unveil “big new” nuclear achievements, The Associated Press reported. Speaking at a rally in Tehran marking the 33rd anniversary of the Islamic Revolution that toppled the pro-Western monarchy and brought Islamic clerics to power, Ahmadinejad did not elaborate on the upcoming announcement but insisted Iran would never give up its uranium enrichment. “Within the next few days the world will witness the inauguration of several big new achievements in the nuclear field,” Ahmadinejad told the crowd in Tehran’s famous Azadi, or Freedom, square. Haniyeh arrived in Tehran for an official trip on Friday and was welcomed by Iranian Foreign Minister Ali Akbar Salehi at Tehran's International Airport. The visit is taking place following an official invitation extended to Haniyeh by Ahmadinejad.